The Book of Genesis tells us that in the beginning was the Word and that the Word was sound. But what if it was music? What if God, in contemplating the creation of Creation, sang being into being? 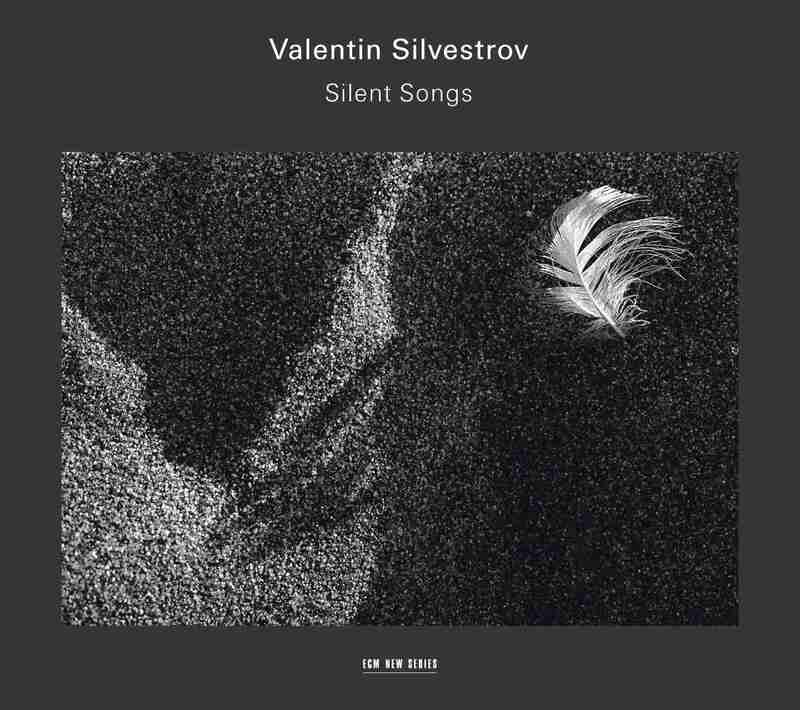 If so, it might have sounded something like the Sacred Songs of Valentin Silvestrov. In this seventh ECM album devoted to the Ukrainian composer’s music, we thusly encounter a sense of space unique to the Russian liturgy: the more the voices unify in movement, the more they lift from one another like temporary tattoos, leaving behind mirror images that wash away with baptism into infinite oneness with the Holy Spirit. Sin as sun. Firmament as fundament. 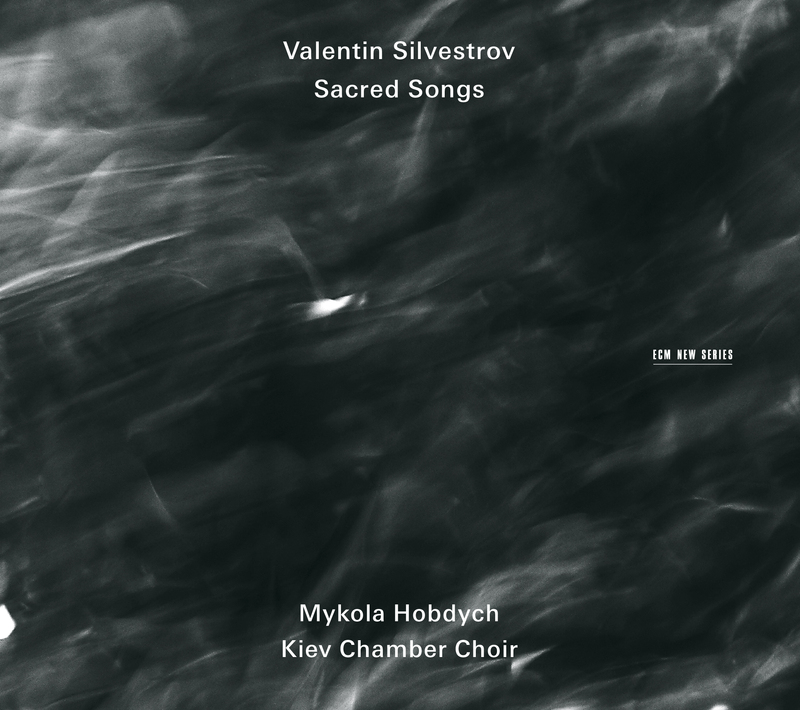 Under the direction of Mykola Hodbych, the Kiev Chamber Choir likewise turns breath into physical substance, each particle activated by thrum of flesh and shaping of air. Although divided into separate collections, Silvestrov’s compositions are together a whole song—if not a song of wholeness. Their liturgical relationships, in other words, expound on mysteries of faith through an abiding faith in mysteries. The grandest statement in this regard is to be found in the Songs For Vespers (2006), which undoes two millennial knots to reveal the single thread within. “Come, Let Us Worship” invites listener and singer alike to set ancient jewels in a modern crown. Its shifting harmonies are sunrays incarnate, each taking ablution by shadow. Soloists blot the remaining songs with their supernova curls, each a messenger of immaculate peace. Among them, alto Tetiana Havrylenko glows without the need for a telescope, revealing the inner venation of sung text, as would a carpenter in wood when staining a table. Tides do not ebb and flow here on a horizontal plane, but revolve in many directions around the surfaces of natural grammars. It is only by brush of torch that their script becomes discernible to the human ear. As the music nurtures its exponents, it riddles temptation with intensities of understanding only found in scripture. Voices change their clothing in a vestry of the heart until their constitution is indistinguishable from the blood that fills its chambers. And in the slumber of a “Silent Night,” footprints leave their impressions in plush snow, extending from a childhood when the world’s shadows were merely the stuff of storybooks and dreams, now creeping into a lagoon of basses. The Psalms And Prayers of 2007 overtake more distant mountains with their sunrise. On their watery surface floats the contradiction of a mortal life, which reaches upward even as it sinks into pleasure. In thinning the scrim of resistance to love, these melodies demonstrate one’s relationship to God as a process. Each glorifies a name that cannot contain its own holiness. With so much brightness to drink in, it is all one can do to keep from drowning. A trio of diptychs follows with further psalms and refrains. At once brooding and angelic, these cycle through pity and forgiveness and bend under the grind of faith and action. All roads then lead to the Three Spiritual Songs of 2006, by which mirrors and eyes change places, so that it is we who come to reflect ourselves. Silvestrov’s output, much like his input, has always been concerned with memory. In this instance, it is a memory of birth that haunts the soul in search of knowledge before creation. In response to that original song, which gave us life and bodies with which to know it, only song can suffice. These are the lullabies that sustain us when the world cages us and turns out the lights. These are the hymns that remind us of the weary when we enjoy the comforts of congregation and rest. 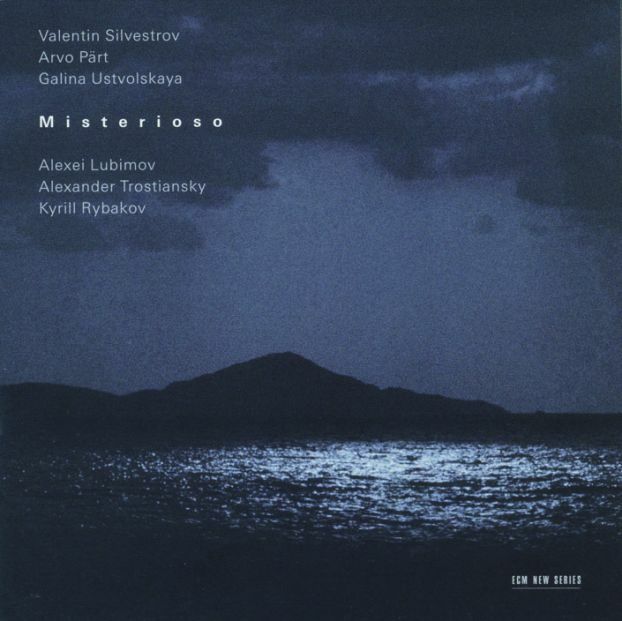 Alexei Lubimov has been painting himself quite the somber niche in ECM’s New Series catalogue, and perhaps nowhere more so than with Misterioso. This suitably titled disc brings the Russian pianist together with two younger colleagues—clarinetist Kyrill Rybakov and violinist Alexander Trostiansky—for a program of splendid contrasts. 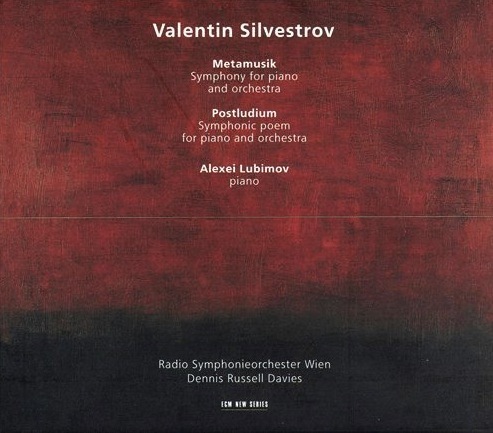 We begin at the end, as it were, with Valentin Silvestrov’s Post scriptum (1990) for violin and piano. Like much of the composer’s later work, it manages to sound like a quotation without, in fact, being derivative—a reference to the abyss in which the creative spirit dances. In this vastly self-referential universe, the balance between drama and gentility breathes in shadowy cascades and pizzicato afterglows. The piano acts as core, while the violin etches upon it signs of its own becoming. Between alternating contacts and separations, the piece eschews sequential development in favor of hopping reflections. Where the Andantino shows a profoundly respectful sense of melody, constructing with minimal elements a fully fleshed organism of song without words, the third and final movement picks up on the plucked themes of the first, sounding almost synthetic in its precision before total dissipation. Silvestrov’s 1996 title composition is the most cerebral piece on the record. Scored for “solo clarinet (with piano),” the piece is dedicated to Evgeny Orkin, a musician adept at both instruments, thereby necessitating the same demands on the contemporary solo performer. What may seem on the surface an elusive piece quickly turns, however, into something geometric, even gritty. Through its protracted twenty minutes we find ourselves at an impasse of time and space. The structure is sporadic, yet bound, every sub-section joined by the barest of chains. It is the temerity of creative life and of the existence that engenders it. Delicate flutters from the clarinet speak of an era beyond the now. Breath is expelled without notes, expressing more solitude than wind. It is the base level of the utterance, a song reduced to its core constituent. One might think there would be no need for another version of Arvo Pärt’s Spiegel im Spiegel (1978), but in this for clarinet and piano we find ourselves regaled anew by its simple, mirrored beauties. The faster treatment here gives it something of a romantic quality and allows it to congeal against the constant threat of silence that embraces it from all directions. Considering the mastery encoded into every moment of Galina Ustvolskaya’s 1949 Trio for clarinet, violin and piano, it’s no wonder the piece remains one of the greatest for its combination. The dynamism of its contours bespeaks a surface tension so resilient that its fulfillment (enhanced by the unification of the album’s three musicians at last) rings genuine and unforced. A jovial sense of play is at work here, skirting an edge between exuberance and emotional turmoil. At moments the syncopation recalls Shostakovich (unsurprising, considering that Ustvolskaya was his student), making for an intense danse macabre. The central Dolce wanders like a creeping shadow into all-consuming thought, and seems to echo the beauties with which the program began, while the final movement, marked Energico, throws us into a murky spiral, crashing in a punctuation of deflated purpose. We end with another Ustvolskaya piece, the 1952 Sonata for violin and piano. Over the course of its nearly 20-minute single movement, we listen as a staggering entity, drunk with regret, turns in on itself, stretching thin like taffy until barely connected to the breath that animates the album as a whole. I would be surprised if Valentin Silvestrov’s Symphony No. 6 (1994/95, revised 2002) wasn’t someday recognized as being among the more significant of the twentieth century. Dedicated to Ukrainian-born composer Virko Baley, another powerful yet under-recognized voice, it speaks as might time itself. 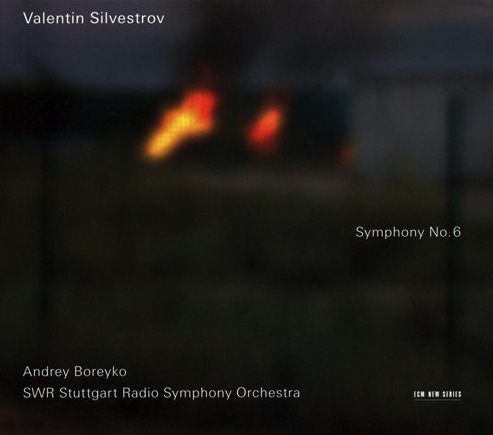 This world premiere recording is still the benchmark, given just the balance of violence and reverie it needs by the Stuttgart Radio Symphony Orchestra under the capable baton of Andrey Boreyko. This piece, perhaps more than any other in the Silvestrov oeuvre, brings a distinctly programmatic energy to the fore of his craft. The first movement gasps like a hospital patient awakening from a horrible accident, pangs of realization shooting through a strung body arching against the onslaught of memory. The second is in the same vein, only now obscured by breath. Yet the heart of this symphony is its third movement, which over a 25-minute span encompasses all that frames it and more. Its sprawling, flower-like opening fears its own beauty, and so it breaks the mirror and swallows it, shard by shard. And as countless lives flow past, uncaught, unexplored, and unheard, Silvestrov’s omnipresent piano presses down from the sky, the detritus of a sifting pan turned ever so slowly by cosmic hands after being pulled from the Milky Way’s tepid waters. Winds and percussion contribute to the mounting sense of doom, forever dispelled by the occasional ray of sunlight. The aching fourth movement assures us of this chain of hopes. Clusters of starlight move like molten lava, leaving a quiet smolder to speak for their passing and lighting up the night like the flames on the album’s cover. The fifth and final movement continues from the unbroken thread of the fourth, a dangling chain that when pulled unleashes the liquid heart of a cloud, the frustration behind a prayer. It is the symphonic equivalent of a master engineer who with attentive fingers turns the dials of some vast mixing board, so that each element swells into a world in which “staccato” becomes a sin to be vanquished with the all-consuming statement of the almighty afterthought. Although he does chart earlier harmonic territories in the Symphony No. 6, Silvestrov simultaneously deconstructs the privilege of doing so, expanding upon each harmonic cell with biological persistence. If the above abstractions leave you with little feeling as to what actually transpires over its nearly hour-long course, then this proves only the weakness of my words and not of the music that prompted them. Listen and be moved. When producer Manfred Eicher decided to make the Stille Lieder of Valentin Silvestrov available on ECM, he accomplished one of the most unprecedented rescue efforts from Russian label Melodiya’s peerless archive. The title, I have it on good word, is more accurately rendered as “Quiet Songs,” and indeed they are startlingly present in their subtlety and depth of thematic power. Silvestrov’s score demands that the trained baritone sing at the threshold of his capacity, enabling a strained, vulnerable quality to what might normally be a commanding eloquence. Yet in that vulnerability the singer spreads wings that perhaps have remained folded since childhood, arresting the heart via a new level of narrative intimacy. The piano, played to gossamer effect by Ilya Scheps, floats Sergey Yakovenko’s emphatic wonders on a current of ink and time. These melodies look deep into the core of every poem (though the music is so evocative one needn’t even refer to the translations), and find in themselves the means to flourish in a space stilled by anticipation. These are mournful songs of lost love, unstoppable nostalgia, and (sometimes satiric) exile, and from their nearly two-hour expanse one is hard-pressed to choose favorites. Yet in the interest of exposition I can hardly ignore the heartfelt intensities—in both composition and performance—of Silvestrov’s Pushkin settings, in particular “Winter Journey” and the elegiac “Verses Composed At Night At A Time Of Insomnia.” Like footprints in snow, they are deep and prone to disappearance. By contrast, two Lermentov settings—“When The Cornfield, Yellowing, Stirs” and “Mountain Summits”—stretch Yakovenko to the cycle’s highest registers, overflowing therefrom with honest innocence. In these one senses the same diffuse gaze as Yesenin’s “Autumn Song,” which aside from being one of the most heart-stopping of the set also lifts us above the landscapes through which we otherwise trudge in desperation. The crowning highlight in this regard, however, is Keats’s “La Belle Dame Sans Merci,” which twists the mind into a simulacrum of its own cognition. Having sung this piece myself, my feelings toward it are admittedly skewed, though I will venture to say that if it doesn’t move you then nothing in these lieder will. “La Belle” is also representative of Scheps’s sensitivity, which renders the keys as might the wind rustle whispers from leaves. It is just present enough to carry along the voice without overpowering it, allowing its contours the grace of self-definition. 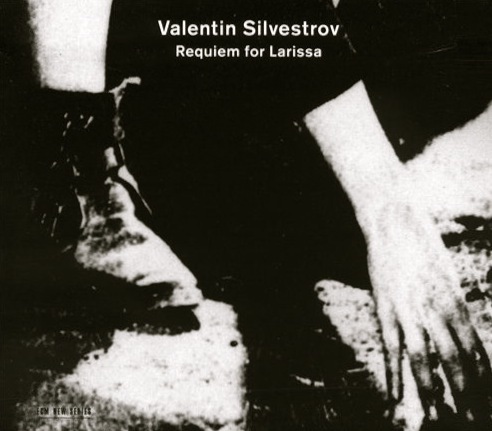 Similarly, Shevchenko’s “Farewell, O World, O Earth” inspires some of Silvestrov’s most inspired songcraft, which he would revisit in his Requiem for Larissa. The program ends with Four Songs after Osip Mandelstam (noteworthy is “Schubert On Water”), with the composer at piano. This quartet is significant not only for being a premier recording, but also for being a rare vocal postludium that, perhaps more succinctly than anything in the Silvestrov oeuvre, encapsulates Silvestrov’s post facto aesthetic with dignity and deference. The writing throughout worms its way into the mind and nests itself where it cannot be reached by waking memory. Rather, it finds slumber in hopes of our own, seeking in the texts a source of fated sound. This is music that stops the heart and starts the mind. An incalculably important recording, at last given the permanence it deserves. Without a doubt one of the top ten New Series albums of all time. “I do not write new music. The requiem is a curious object: on the one hand it memorializes someone important to the composer, while on the other most listeners will have never known the dedicatee. In that sense the requiem fulfills a transitory function, and a communicative one at that, bringing a sense of relational knowledge to the abyss. In the case of Valentin Silvestrov’s entry into the Requiem ledger, I feel only the mise-en-abyme of love, and the shape of its web after a cold wind has snapped half of its axial threads. Written between 1997 and 1999, it was intended to be the Ukrainian’s last composition—so affected was he by the death of his wife, musicologist Larissa Bondarenko. As with his above sentiments, the sound-world it introduces to us is a churning sea bordered in humility. The more one listens to Silvestrov, the more one becomes accustomed to the piano’s (omni)presence in his orchestral imagination. It is both center and periphery of an ever-expanding field in which the wool of darkness is spun into light. And thus it is from the piano that the Requiem’s vocality proceeds, the choir sewn into the larger fabric with divided immediacy, such that emotions merely constitute an audible act shrouding an internal need for stillness. Tenor and alto solos shimmer against a reverberant mesh of harp and strings, each a clear path to struggle. In them Silvestrov admirers will recognize a redux of his Shevchenko setting in Silent Songs, and in the Agnus Dei a choral expansion of his Der Bote, the last piece of her husband’s Larissa ever heard. Though cut from a template, they whisper a self-taught language. Winds pressing in at all sides carry us back into the piano’s embrace, in which we realize that heaven is not a space above but one within. Retreating farther inward, morning glories all, we fold in moonlight with a simple bow, finding some respite in the laborious nature of our surroundings. Effervescence balances at the fulcrum of acceptance, only to be dispersed in the swirling pool of the final section, dissolving behind closed eyes. I know I would not be alone in expressing thankfulness that Silvestrov has since continued to compose, but in doing so I would be missing the point. Aside from the long-distance comforts my meager consolations may or may not provide, such a gesture is as tear-distorted as the sounds that inspired it. I might also praise this recording for its engineering, performances, and packaging, but when reviewing a requiem these concerns are inconsequential. There is no way that such a project could defeat itself, for its heart has already been punctured by the loss from which it continues to grow. It is its own entity now, atrophied and crawling, searching for rest in a landscape without berth. Larissa was unknown to me, but whenever I listen to this music in her honor, I feel as if that lack of knowledge becomes filled with something vaster, a nourishing remembrance that sustains everything we are once we have been thrown into the center of the universe to slumber whence we came. All too often, contemporary classical music is framed as a forward-looking genre, falling under the rubric of “new music,” as if it somehow grew of its own accord in lieu of outdated motives. But then we encounter a figure like Valentin Silvestrov, whose music always seems to look into a watery mirror and tells us that the more this art form progresses, the more it mines the depths of that which has passed. Such is the realization that brings purity his Bagatellen (2005), a set of simple piano pieces that practically weep at the composer’s fingers. Airy at first glance yet overwhelming in their melodic weight, they record rather than create, though they more than diaristic. These are images in constant motion, a far cry from family photos with timeworn edges. Some speak with the clarity of a digital home video, while others drown in the timelessness of grief. Their cyclical structures lend a delicate urgency, one that speaks to the validation of reminiscence as a primary mode of expression. After such quiet, inexpressible splendor, to be confronted with the extroverted qualities of the Elegie for string orchestra (2002) is to experience the trembling heart of something ancient. And as the strings continue their serenade in Stille Musik (2002), we feel an acute suspension. Not of winged flight but of the marionetted body that knows its limits in the grand scheme of falling, never quite sustaining its foothold once found. A stilling rendition of Der Bote for strings and piano (1996) is the album’s centerpiece, and one of Silvestrov’s most masterful forays into harmony. This distorted Mozartean wind tunnel of cloud and afterlife lies also at the heart of his Requiem for Larissa. And it is into afterlife that we continue with Zwei Dialog mit Nachwort for string orchestra and piano (2001/02). Dripping honey from a ruptured hive, this is music that luxuriates in the full spread of its pathos. As might a drop of ink into water, it opens its tendrils slowly, well aware that without the invisibility of its surroundings its mapping would mean nothing. 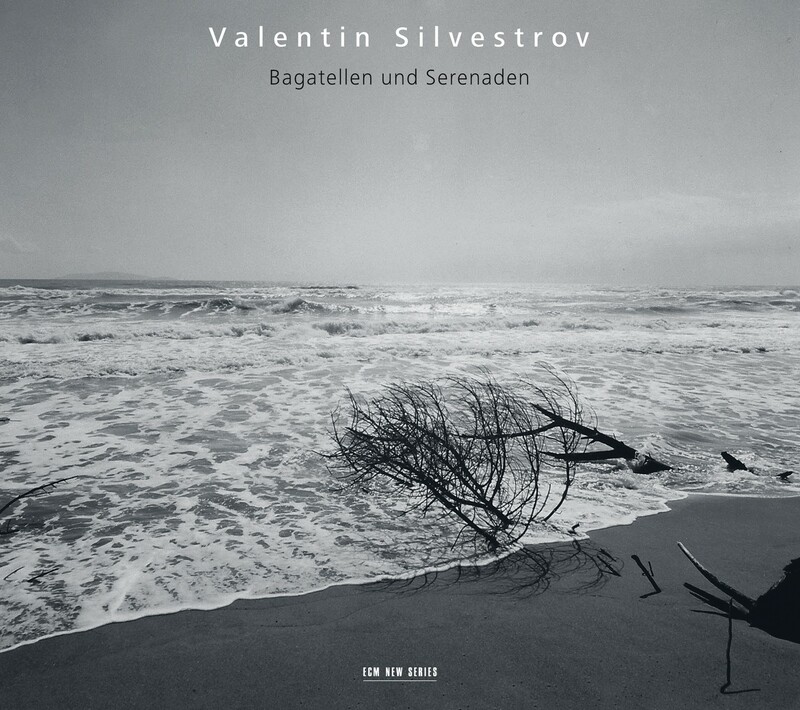 It bears noting that the Bagatellen were recorded by chance when, before and after this album’s orchestral sessions, Silvestrov played alone at the piano while the tape (such as it is in the digital age) was running. Although he never intended to contribute to this recording in such a physical way, we can only bow in gratitude that he did. One gets the sense that each fragment is a portrait of his life in miniature. In a world of tiresome postmodern gestures, sometimes we need to wrap ourselves in something so mysterious that it can be nothing but a comfort. Let this be your blanket. “Meta” is a prefix often thrown around without much thought as to its origins. The academic world of which I am a part is especially fond of it. Yet the nuance of “meta” as “transcending” (as in “metaphysical”) is a mistake born of frequent misuse and reinforcement. Its origins lie in the Greek preposition, which means “in the midst of, in pursuit or quest of.” These get us closer to the heart of Metamusik, the title of a one-movement symphony for piano and orchestra from Ukrainian composer Valentin Silvestrov that forms the bulk of the third album dedicated to his music on the ECM New Series. And indeed, the opening proclamation of the selfsame composition already sounds as if it were in the midst of, if not in pursuit of, something. And while I normally find that Silvestrov’s motivic denouements emote more effectively in concentrated settings, in this case I find that the 48-minute running time allows both listeners and performers all the breathing room they need to delineate its finer anatomies. The soloist here is Alexei Lubimov, who first introduced us to Silvestrov in the ghostly recital, Der Bote. His role, however, is neither to lead nor respond, but to inhabit as many particles as he can of the piece’s opening Big Bang. These, he connects through a wavering orchestral environment with planetary care. He opens every note like an ocean in and of itself, ebbing and flowing simultaneously, redrawing the same lines along the shores of unpopulated worlds. It is that rare sound which mesmerizes by way of dark matter and black holes, falling without end into a void of shifting pathos. Whether our eyes are closed or open, we see nothing but the nebulae of our own consciousness, naked and diffuse. If by now any of us expect to achieve familiarity in the accompanying Postludium, then we need only still ourselves before we are ready to see. The title here is another didactic one. It is Silvestrov’s default modality, the aural afterword to a non-existent referent. In short: an epilogue to silence. And though these same musicians may exert themselves and the composer may labor over the staves that engender the music’s emergence, our experience of it lacks the immediate visceral connection of having performed it. (It is just such a chain of meteoric intentions that binds us to the postlude as “genre.”) In acknowledging an emptiness from which forms all matter, we also know there is emptiness to be squeezed from the tangible, somehow beautiful in the embrace of our acoustic validations. We may float without direction, but Silvestrov seems to say that our voices, the very notecraft of our being, are the only compasses we need. The power of this music speaks differently to all of us. It is a living force that mimics whatever vessel contains it. It is also a blank page: present yet weightless with meaning. Silvestrov’s is a sound-world of punctuation marks. It is up to us to fill in the words. 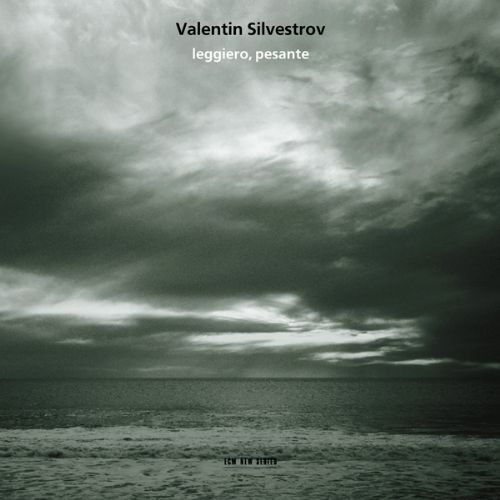 With leggiero, pesante ECM devoted its first entire disc to the work of Valentin Silvestrov, inaugurating an ongoing series through which the label has been documenting a quiet musical path that had, until then, led the composer to great acclaim hardly anywhere beyond his native Ukraine. As one who often works in larger forces, Silvestrov was, I think, wisely introduced to listeners through this program of chamber pieces. To be sure, his statements are no less expansive here, but one sees more clearly in the capillary motifs that so fascinate him, and us, with their inner life. If the opening Sonata for cello and piano (1983) is a mirror, than in it we catch only fleeting glimpses of faces that, through the magic of performance, are slowed like a film reel until their pathos becomes clear. Intense dynamic contrasts ensure that silences are as full as the notes that cradle them. Pianist Silke Avenhaus and cellist Anja Lechner offer a painstaking reading of this rather difficult piece, which challenges with its need for emotional over technical virtuosity. If the String Quartet No. 1 (1974) is a breath, then each instrument is a sheltering lung. The first violin stretches its capacity, exhaling a jagged agenda against the linear regularity of the trio from which it is birthed. As these become increasingly convinced of its mission, they join the violin in song, only to fall back into the folds of their complacency, leaving the violin to weep for its lost cause. The Rosamunde Quartett’s performance is transparent and honest and ensures that every stage of this mournful journey is illuminated by salvation. If the Three Postludes (1981/82) are hands, then each grabs the wrist of the other in an unbreakable triangle. Postludium No. 1 is a swan song for Shostakovich and uses the composer’s DSCH cryptogram to satoric effect. Soprano Maacha Deubner reprises the profundity she brought to Kancheli’s Exil, loosing her angelic rain through a gossamer fabric woven of violin and piano. Violinist Simon Fordham makes of Postludium No. 2 an enigmatic complement, while Avenhaus and Silke return for the delicate charm of Postludium No. 3, honing a brightening edge in an otherwise murky recital. The composer himself takes up the piano for his closing Hymn 2001, dropping highs like spores into the instrument’s freshly tilled lows, where they are silently absorbed to begin the cycle anew. As the album’s title makes abundantly clear, Silvestrov’s music feels light, but in being so is immeasurably heavy. Just when it seems on the verge of fading like a mist in morning light, it curls back from the binds that loop it firmly around our attentions. It is not that these binds are particularly restrictive, only that the music is so much at peace in their gentle capture that its shoes remain unworn.